"Soon I am going to be with the saints to rejoice with them. I don’t want the world or anything in it. I want to be in the presence of my Lord." Oh, let the nations be glad and sing for joy! For You shall judge the people righteously, And govern the nations on earth. Jesus said to his disciples, "They will hand you over to be tortured and will put you to death, and you will be hated by all nations because of my name. Then many will fall away, and they will betray one another and hate one another. And many false prophets will arise and lead many astray. And because of the increase of lawlessness, the love of many will grow cold. But the one who endures to the end will be saved. And this good news of the kingdom will be proclaimed throughout the world, as a testimony to all the nations; and then the end will come." The music today is a Christian song in the Malayalam language, which is a language of coastal southeastern India. There is a large Christian population in this area, due in part to Portuguese influence. 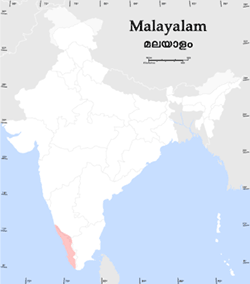 The pink area on the map is the State of Kerala; about 20 percent of the population is Christian. While these faraway and exotic names mean little to most Americans, consider that there are about as many Christians in Kerala as there are Mormons or Methodists in the United States. Christ said, "good news of the kingdom will be proclaimed throughout the world", and we must always remember that we have brothers and sisters in every culture in the world. 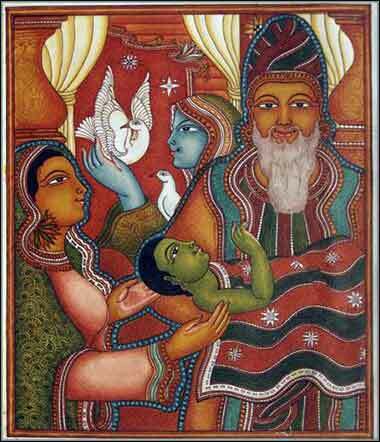 When we get caught up in church politics, remembering the sheer number of Christians in all corners of the globe -- even in countries such as India, which are dominated by atheism or by other religions -- helps bring our problems into perspective. And while the music and dress of the people might seem strange, consider for a moment that, in many ways, they are fundamentally more similar to you than the atheist or agnostic who lives next door. We should also reflect on how many Christians there are outside our culture: the charming hymn in today's prayers, which seems so minor, comes from a church that roughly the same size as well-known Protestant churches in the US; it would be the sixth largest church in the US, just about tied with the Mormons. Christ's message is being proclaimed throughout the world and not just to tiny splinter sects. On an average Sunday, there are more Anglicans attending church in Nigeria than in Great Britain, despite sometimes violent attempts by Nigerian Muslims to suppress them. So today we remember our brothers and sisters all over the world, who are so distant in geography, language, and culture; and yet, who are so much closer to us in the Spirit than many of our neighbors. And let us pray for them, for they often face a degree of persecution we will never know.